"When I was 14 years old and listening to the radio and I heard the announcer, '…and still champion of the whole world, Rocky Marciano….' I knew I wanted to be champion someday. He was a big influence in the start of my career." Stephen Holland is well known as the top selling artist of sports. But if you were to pull up a stool in his Santa Barbara studio and ask him what it is he actually paints so amazingly well, he'd probably say, "I paint tough guys". From the stadium green, to the silver screen, from McGuire to McQueen, Stephen Holland has captured, in paint, every version of the tough guy hero one could imagine. 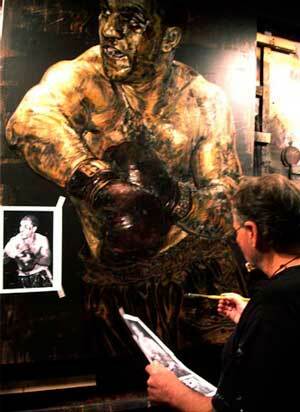 It was because of this, that the choice to paint the great Rocky Marciano, had all the potential to be one of Holland's greatest works. Marciano achieved an entire professional fighting career without one loss. Leaving the ring as the only heavyweight to retire undefeated in all but two of his fights resulting in a knock out. He was a self trained fighter, who used a stuffed laundry bag as a heavy bag stand-in, as he scrapped together his fighting career. Having grown up as the son of poor immigrant parents in Brockton, Massachusetts, where the only prospects were shoe making or the army, it was easy to understand how the common-man easily gravitated to a fighter from these roots. Marciano would not let any comer defeat him in the ring. "I believe, in my prime, I could have fought with anybody alive." In The Ring, I never knew fear." Known as a relentless fighter with a punch that can send a gifted boxer straight to the mat, Rocky is perhaps the great tough guy archetype of the 20th century. 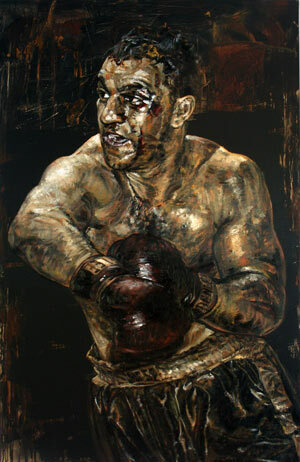 As such Marciano has made for both the perfect subject and muse for painter Stephen Holland. When Holland was asked about this latest work he replied "I think this is one of the best paintings I've ever done", "When I finished this painting, I stepped back and said 'holly s--t' ."